In this episode, I sit go over 3 tips for teachers now that we are back into the swing of things. I also give a couple of digital tools to help you organize your workflow, and life! Happy belated International Podcast Day and thank you to Sarah Thomas for the shoutout that day. All music in this episode was produced using Soundtrap. Check it out for yourself and tweet your thoughts using #Soundtrapitis and #EdTechBites For a 3 month trial of Nearpod, go to nearpod.com/redeem and use promo code "NP-Gabriel". If you'd like to purchase WeVideo For Education, email John Kline (johnk@wevideo.com) and mention that you heard it on EdTech Bites for 10% off a classroom license, 15% off a school license, or 25% off a district license. 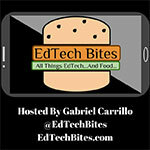 Lastly, The EdTech Bites Podcast is now on Patreon. If you'd like to support the podcast by becoming a patron, check out patreon.com/edtechbites. Don't forget to subscribe, tell a friend, and write a review on your favorite podcast app. Buen Provecho!